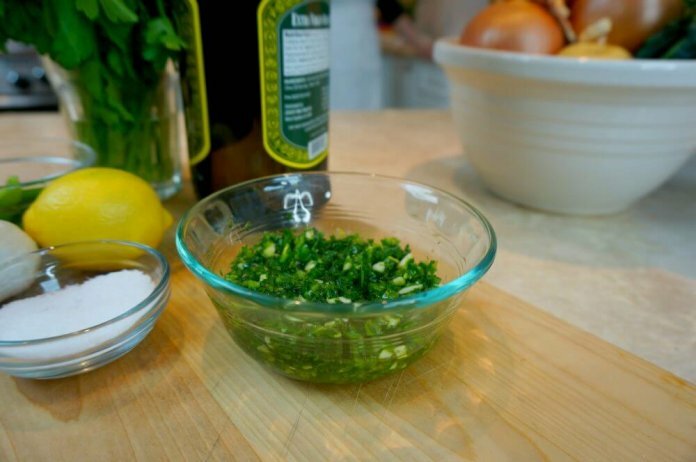 This Spicy Gremolata has joined pesto as a pantry basic in my kitchen. It is a wonderfully healthy condiment bursting with vitamin C among other things, and with flavor that will liven up any simple soup, or plain cooked fish or chicken, even if you are on a low fiber diet. A little goes a long way, but because it freezes really well you don’t have to worry about making too much. Just bag up what you don’t use and freeze it to jazz up another meal another time. Watch the video to learn how to make it. 1. In a blender, blend the oil, garlic, lemon zest and jalapeño or serrano pepper. Gradually add in the herbs and salt, blend until smooth. Taste for seasoning. If you don’t have a blender, you can chop the herbs, zest, and salt together on a board, adding in 2 tablespoons of the oil a little at a time. Scrape into a small bowl and stir in the remaining oil. And if you’re worried about this being too spicy, either make it without the jalapeno – it will still be really good, or add the jalapeno a little at a time until the gremolata is to your taste.